The Facebook status has quickly become an iconic symbol of a specific moment in social technology. Millions of people rely on their Facebook status for a growing list of purposes and reasons. Some are turning to their Facebook wall as a way to vent their frustrations, businesses are using it to connect with customers, while others are turning to Facebook as a way to tell their friends where they are going or what they are doing. The more that we look into these status updates themselves, the more that we can learn about generations and society as a whole. We can start to pick apart the different actions that people take and the social trends that are influencing what we talk about, what we purchase, and what we think. Facebook’s Data Team took the time to look at the use of the Facebook status, using over 1 million Facebook statuses in a note known as “What’s On Your Mind?”(1). The team broke up statuses into word banks, focusing in on the words used and the purpose of those words. There are certain things the team found that are fairly obvious at first – the idea that positive statuses are more frequent during the day, and negative statuses are more frequent later in the day. Take a look at their findings below. 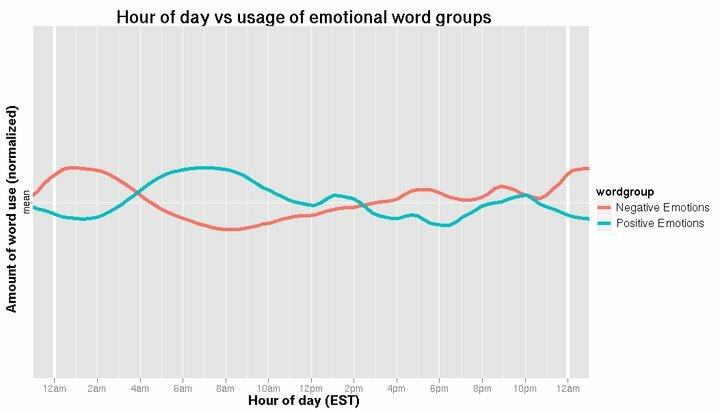 Positive emotional word use is higher in the mornings, when the corresponding usage of negative emotional words is low. Negative word use increases as the day goes on, as positivity decreases. The Facebook data team even found that the charts they pieced together with these word banks “confirm(s) the typical stereotypes about younger and older people”. They note that the youth polled used curse words more often, and that their emotions were more negative. Adults, on the other hand, had updates that were longer in length and talked less about themselves and more about others. Simply put, our Facebook statuses directly reflect the way our society both works and acts. We can look at Facebook statuses to completely understand the mood of a wide variety of groups of individuals. 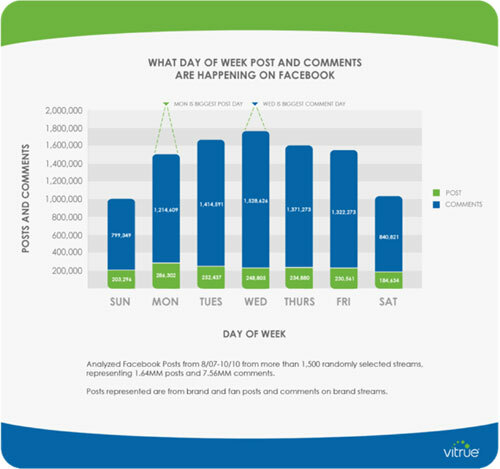 This data could greatly influence how businesses use Facebook to market to other users. When To Make A Status Update? Thinking about the time that Facebook users update their statuses indicates the time that they are on Facebook the most. Any business or individual looking to catch a large group of people are going to want to post at that time. Remember the ole adage “fish where the fish are”? Take a look at this incredible data from Virtrue. This is especially good to know if you own a restaurant. Are you posting specials? Pictures, videos etc of your tasty menu items when people are deciding on lunch? 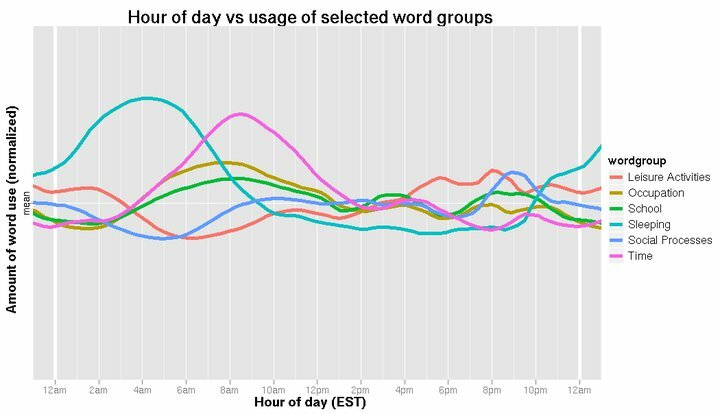 Virtrue found that “the three biggest usage spikes tend to occur on weekdays at 11:00 AM, 3:00 PM, and 8:00 PM”, with the biggest spike occurring on 3:00 PM (1). 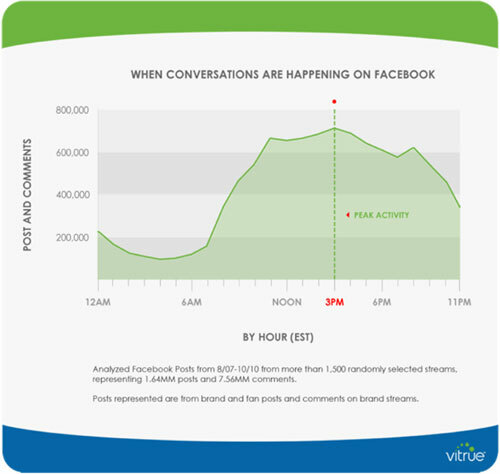 With that being said, Virtrue found that posts in the morning are 39.7 % more effective than afternoon posts. So what does this mean for those who use Facebook and those who are trying to harness the power of Facebook for their business? As a social media consulting & training company, here are some of our (SayItSocial’s) conclusions to this incredible data. Age stereotypes are key when thinking about your target audience. Younger users are more prone to talk about themselves and think about themselves, whereas older users are more prone to think of others. Use this to your advantage when launching a contest, viral campaigns, or Facebook marketing (PPC) ads. Posts are most effective at 11:00AM, 3:00 PM, and 8:00 PM. Post during these times to grab the attention of the largest slice of your target market. o Knowing this, schedule your “engagement” “social media outreach” and marketing efforts during these times, however ALWAYS respond at any time. Finally, it’s about relationships people, make sure you don’t abuse this data, but use it to foster and build relationships, advocates. As we teach in our classes, Advocacy is today’s ROI! Special thanks to the Facebook Data team & Virtrue for providing this data.